For a while now, card making has been more obligation than enjoyment. Long (and personal) story. But when making this card I rediscovered some of the pleasure it brings! Aah, it's been a while since making a card was this much fun. 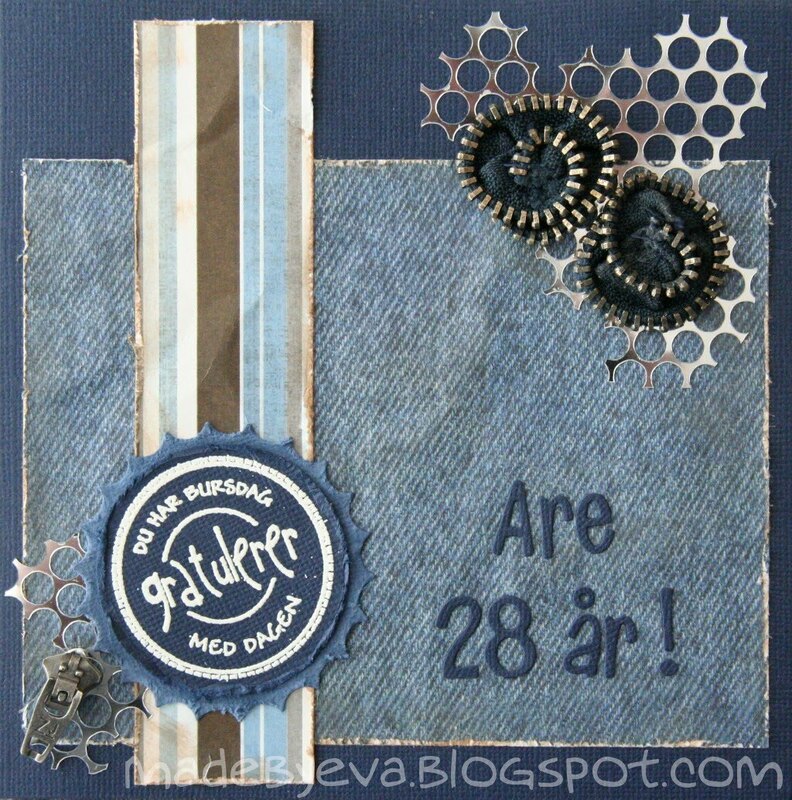 :) My brother Are has turned 28 and needed a card from me as well. Masculine cards are always challenging, but I got an idea, ran with it and feel quite pleased with the result. I have a thing about using flowers on men's cards... Ok, there are some times you can get away with it, but I avoid it whenever possible. But that leaves the question of what on earth can be used for embellishments?? 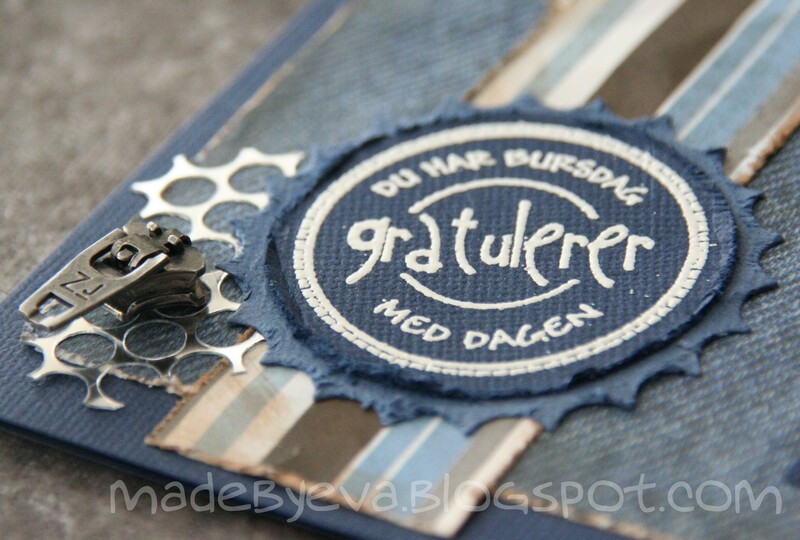 This time I deconstructed the zipper in a pair of my worn-out denim trousers. 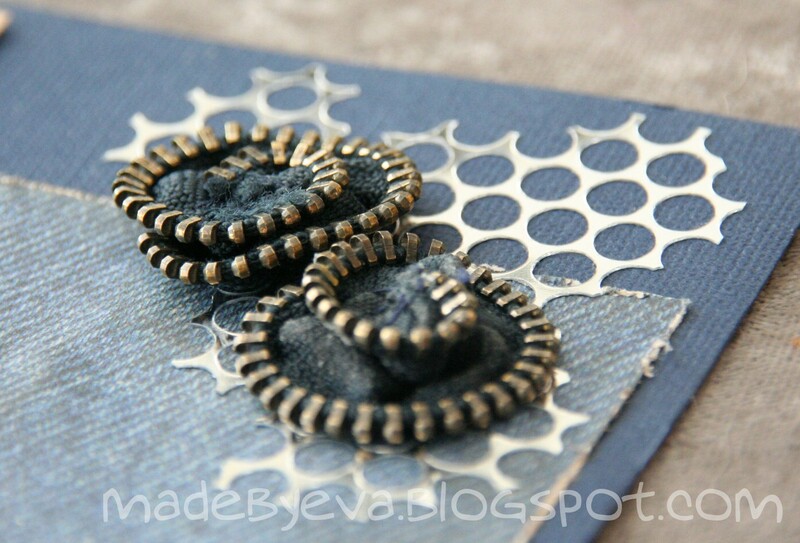 A few stitches secure the folded zipper halves in the shape of a rosette and ordinary craft glue holds them to the card. I would have tidied up the center a bit - but hey, these are rough, masculine rosettes - I take this seriously, mind you. ;) The cool silver stuff underneath is Panduro Punchinella. Even the zipper pull made it onto the card! I simply tied some Scrapper's Floss around it , pulled the floss through a hole in the DP and secured it there with some glue. The stamp has been embossed in white and the inverted scallop mat matches the shape of the Punchinella perfectly.